In Southern Kentucky, 7-year-old Malachi is excited to send a personal note to his sponsor. This thoughtful little boy puts a lot of heart into the words he chooses. “I’m a hero because I’m… smart!” he writes. He then adds a colorful drawing of his mother, wearing a pink cape — an example of his very own super hero. Growing up in Kentucky has not been easy for Malachi and his mother. Their small, rural community struggles with the all too familiar challenges of poverty – lack of teachers and materials for quality schooling, few jobs that pay a living wage, and high unemployment. With his teacher’s help, Malachi is able to practice reading and get the writing support he needs to thrive. Malachi is lucky, however. He has a very close relationship with his mom – a single mother who is working her hardest to create a good life for her family. She has been able to find jobs, but their two-person family has faced significant financial setbacks in recent years, and she cannot meet his basic needs. On top of this, Malachi has had difficulties focusing on his studies in school. But while they may not have many material possessions, they are grateful for the richness of the love they share and their strong bond. Malachi’s mom has been an advocate for Malachi and a strong supporter of his education. Before being sponsored two years ago, Malachi was tracking behind the average literacy expectations for kids his age. He didn’t always turn in his homework and struggled to focus in the classroom, more than his peers. Since joining the sponsorship program, his word recognition, basic literacy skills and reading comprehension have all shown improvement. Paying attention in class is no longer a struggle. Check out that big smile! Thanks to sponsorship, Malachi now loves to read – and it shows! “After-school I go to Bulldog Club,” said Malachi, beaming. 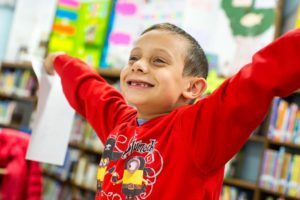 “My favorite thing to do there is read!” Malachi’s favorite books are about dinosaurs and he takes great pride in the fact that he can now read confidently. The after-school program is funded by sponsorship and includes reading practice, writing support and listening to stories read aloud. Malachi’s mother is just one of many parents who has seen the after-school program make a significant difference to her children and in their close-knit community. Save the Children’s literacy program helps give children growing up in America’s poorest communities a the opportunity to learn. Children in these places have the potential to improve their knowledge and boost their confidence — the stepping stones for a successful future. 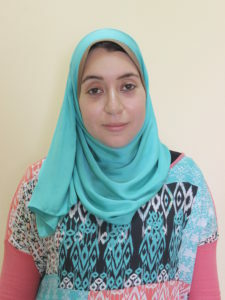 25-year-old Samar lives in Abnoub, Egypt and worked as an unpaid volunteer for the Community Development Association for Orphan Care, known locally as CDAOC, for a full year. However, she felt that she could do even more to help children in need. 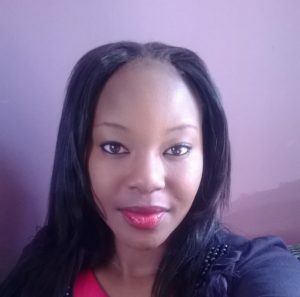 She wanted to prove herself and also showcase the work she was already doing to help local children. She took on a number of health projects initiated and funded by local foundations and government entities, including the Ministry of State for Family and Population Affairs. In these projects she conducted health-awareness campaigns, for example spreading messages on the importance of keeping a clean home and properly disposing of garbage to reduce the spread of disease, among community members. Samar conducting a training with local nurses. Despite her efforts to document and share her successes, Samar didn’t feel that her work was well recognized. 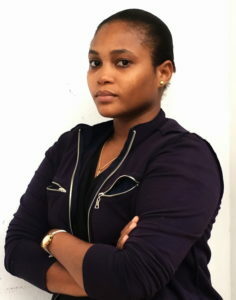 Until one day, the senior supervisor of health projects from Save the Children paid her a visit. 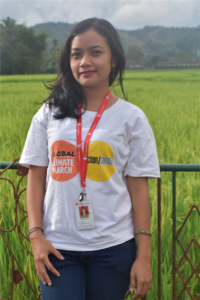 Samar jumped at the opportunity to connect with the organization. She introduced him to her work, and he went on to spread those successes in improving health and hygiene in communities to other governorates all over the country. 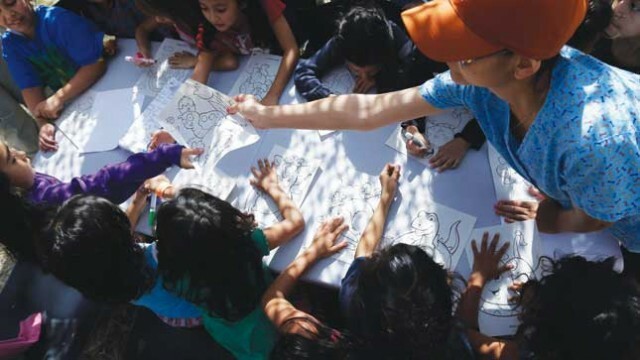 After that, when Save the Children was looking to select new health program team members, they chose CDAOC to partner with and specifically reached out to Samar. Samar began conducting workshops to train female village leaders, community representatives, mothers and nurses on Sponsorship’s evidence-based and innovative programs, which spread health messages to local women using tools like educational videos and play-acting to keep them engaged. Topics include how to recognize dangers signs during pregnancy, the health benefits of breastfeeding infants, the importance of vaccination, basic first-aid for accidents in the home, and much more. Samar with participants of one of her health sessions, and their children who will surely benefit! She also received trainings in what Sponsorship calls “Kangaroo Mother Care”, an initiative which imitates the way the kangaroo carries her baby. This improves mother-to-child attachment, providing newborns with continuous affection and tenderness that aids in a healthy upbringing. 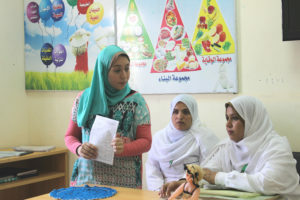 Through these sessions and other trainings, Samar learned how to examine a new-born child, as well as deliver community- and home-based meetings for pregnant women and mothers of newborns on skills for the healthy nutrition and care of their babies. Today, Samar feels fulfilled in her life. She is now a certified trainer of the Assiut Health Directorate, thanks to her work with Save the Children, and possesses countless health certificates. Her name glows next to the names of university professors, doctors and hospital managers on training materials that are shared nation-wide. We are very proud to have her as a partner! 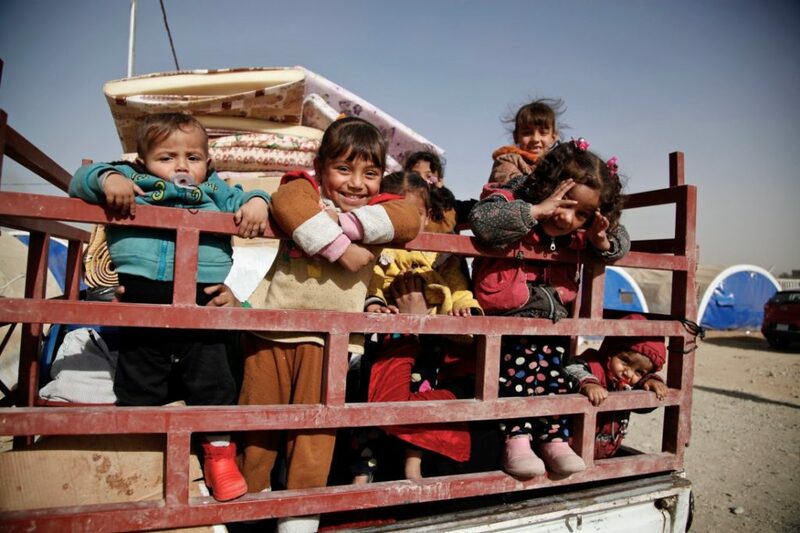 Sponsorship’s ultimate goal is always to prepare the communities to be able to continue our programs on their own one day, without Save the Children’s support. As we are now about halfway through our planned time in Dessalines, from arriving in 2012 to our planned exit from the community in 2020, we want to make sure that the capacities of the communities and schools we work with are strengthening. A child participating in one of our summer camp activities, making art from recyclables. One aspect of our work through which we can assess the success of our programs is by the local summer camps, which were started thanks to Sponsorship funding. Week long camps this year welcomed more than 600 girls and boys from ages 7 to 16. 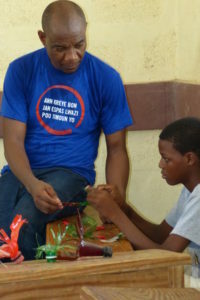 Kids received lessons in arts and crafts on skills like making floral arrangements, macramé and ways to recycle trash into art. Children also benefited from sessions on health and hygiene topics, for example how to identify nutritious foods or, for adolescents, how to maintain their sexual and reproductive health. These camps also provided an opportunity for the school council members, representatives from the local government, trained teachers and volunteers from the community to demonstrate the skills gained through trainings provided by Sponsorship. Save the Children in Haiti program staff watched as camp activities unfolded – both camp facilitators and children were eager to share all they had learned. For the adults present, it was clear they shared great interest and a common sense of duty and responsibility to ensure that the highest standards are maintained for educating the local children. Children performing a song during the closing ceremony for the summer camps. The camps closing ceremony was the perfect moment for the participants and actors to express their joy with the summer camps and likewise the good work Save the Children is doing throughout the community. It was agreed on by everyone that next summer the camps would continue, and the community happily offered to lead in taking ownership in running the camps this time. We look forward to a smooth and efficient transition of activities! Your sponsorship supports your child’s growth and development and empowers community members to sustain the work we’ve started. 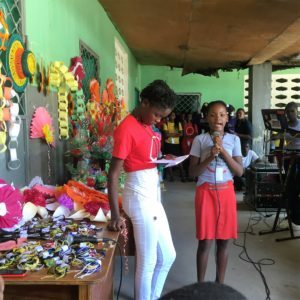 For our sponsors of children in Dessalines, we hope you continue with us on this journey through the end of 2020 – when our programs will be solely run by community members and we will move on to other areas in need in Haiti. For many people, the 16th of June represents a special day every year, as the Day of the African Child. This day has been celebrated since 1991, originally honoring the South African children who marched against the government in their mission to receive a better quality education. Today, celebrations are held every year in all African countries with the aim of raising awareness on the challenges children currently face across the African continent. Themes for the celebration are chosen on an annual basis. The 2016 theme was Conflict and Crisis in Africa: Protecting All Children’s Rights. The aim of this theme was to elevate the child protection agenda in conflict situations in Africa, as well as generally furthering the well-being of the African child. A group of teens presenting with the large crowd behind them. The commemoration took place at a Sponsorship-supported primary school. Save the Children, together with other stakeholders such as local youth groups, universities and government partners, supported the day’s activities, and it was a very flamboyant event! The day started with a street march led by a police band, who walked from the community’s trading center to the school grounds where the celebrations would take place. The brass ensemble, clad in their standard khaki outfits, pulled crowds to the ceremony as they played in beautiful rhythm. All around gathered many spectators and children, visibly dressed in the Day of African Child t-shirts Save the Children had provided. Children while watching the days festivities. Though it was scorching hot, it did not quench the children’s excitement. Songs were sang, plays were staged and their voices were heard. 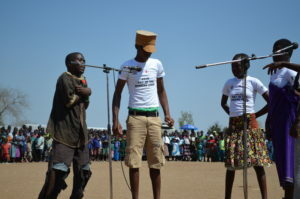 Teenagers in particular had fun role-playing for the crowd to demonstrate the harsh realities many children face. 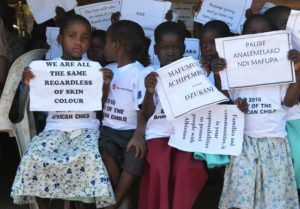 The messages from the children were clear: stop abduction and killing children with albinism, protect children from hunger, stop sexual abuse of children during crisis. Government representatives and stakeholders pledged their support in protecting and promoting the rights of children, and the children joined them in their commitment as partners for the future. Life in Weihura, Wanukaka may not be easy for Uli, a hard working farmer. Yet he never fails to welcome each day with a smile. With that gap toothed smile, he shows his daughter how to appreciate simple beauties in the midst of life’s difficulties. Ignoring his constantly sore back from ploughing the paddy fields, he still carries his four-year-old little girl, Tika, on his shoulders to kindergarten. “I want all my children to be well-educated so they can have a better future. There is no future without education. 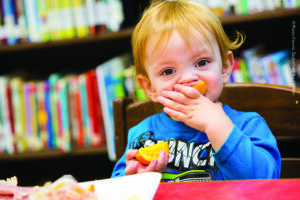 I will do whatever it takes for them to get the education that they need,” he said enthusiastically. Sponsorship staff member Malini meeting with Uli to hear about his experience in parenting classes. On certain days, Uli attends parenting classes with other parents at school. 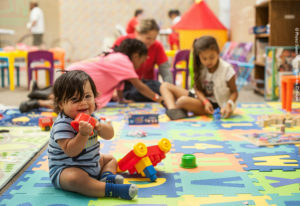 In these classes, he learns how to communicate with his children in a better way. He used to get angry very easily with them even at their small requests. Now he has found himself more patient and communicative. He has also found that Tika is getting closer to him. They now spend time after school playing together. There is no longer fear on Tika’s face every time she comes to him for a question. 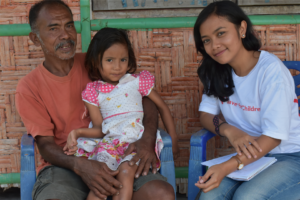 He has learned how to explain things to her very gently, “It is redemptive to experience the better connection between Tika and I. I feel like I am a good father to her,” he proudly said with a big smile on his face. Thanks to our sponsors, parents like Uli in Indonesia are learning how to better connect with their children each day, not just in terms of their learning but also emotionally. Building the relationship between fathers and daughters is so important, not only in the places where Sponsorship works but also here in the US. Do you have a special father-daughter memory you can share with us? Meet Mikenzie: All Smiles Because of Sponsorship! 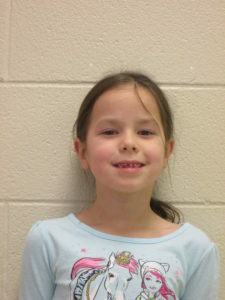 Mikenzie is a happy first grader who participates in our in-school literacy and Sponsorship programs. Mikenzie usually has a smile on her face, but when she receives a letter from her sponsor this causes an even brighter smile to appear! She loves receiving letters in the mail and keeps them in a memory box at home. The encouragement and praise she hears from her sponsor about her schoolwork has had a big impact on her confidence. Mikenzie had some anxiety related to reading and had been diagnosed with dyslexia before participating in our literacy program. Through the in-school program, she has discovered a love of reading and now has a drive to learn new words and challenge herself. 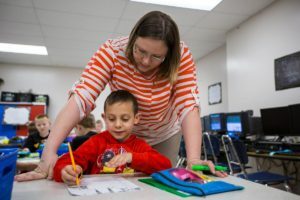 Her current favorite book is “One Fish Two Fish Red Fish Blue Fish” by Dr. Seuss, but she hopes to learn to read “big, hard books.” Mikenzie’s teacher has seen a difference in the classroom with her reading fluency and her confidence. Mikenzie playing a math game. Mikenzie’s mom reports that Mikenzie cannot wait to get to school. She now has a love for learning that her mom has never seen before. The Save the Children program also provided much needed support when Mikenzie recently lost her grandmother, whom she was very close to. When asked what changes she’s seen in Mikenzie since she began participating in Save the Children programs, her mom says, “I never knew it was possible but she smiles more.” The Save the Children literacy and Sponsorship programs have helped Mikenzie develop a love of reading and learning, provided a strong support system and boosted her confidence.